Sometimes I believe that when R.R. Martin was writing "A Song of Ice and Fire", he was actually referring to my relation with Gradle. Until the beginning of this year, I was a profound believer of the modular Eclipse platform, and did develop anything with it: from PHP (PDT) to Java/Android (ADT), even Node.JS passed its 'revue'. 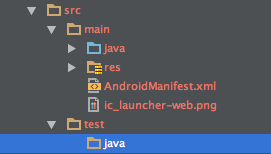 As a new challenge, I downloaded the (IntelliJ-based) Android Studio IDE for my new project. Google decided to use Gradle as it foundation build-automation-platform, and even went thus far that it integrated it seamlessly in the IDE experience. Sometimes you need a new challenge and went full speed ahead. Android Studio is still in development (the current Canary build marks 0.4.4) and can thus give you some head-aches ("why can't I remove a module with a push of a button", "why do I need to write code when I just want to add a jar-file to my build path", "what the hell is Gradle doing with my classpath? ", etc). I must say that between the stable 0.3.5 release in the beginning of the year, and the 0.4.4 Canary build from February, that a lot of progress has been made. Let's get back to the topic: you have started a new project and are going to add Robolectric to your TDD Project. How do you handle it? As we are promoting Test Driven Development (TDD), let's first start on setting-up the Robolectric installation for Android Studio. First, create a new location for the tests. I like to keep my tests on the same level as my sources, so I created a folder /src/test in my "app" module. Enter "test/java" as name and press "OK"
As you might notice, the first (main/java) folder is marked in blue, which means that it is actually a source folder. 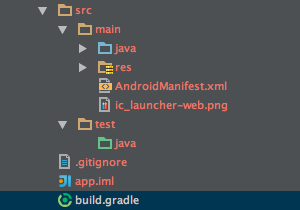 In Eclipse you would add the /test/main folder to your source configuration, but this is Android Studio... we need Gradle to do this for us. May 26th 2014: with recent developments in Android Studio and Robolectric, please check out this update on the build script and how to test. Most of this blogpost remains valid though. Now update your project to match the Gradle build file, via Tools > Android > Sync Project with Gradle Files. 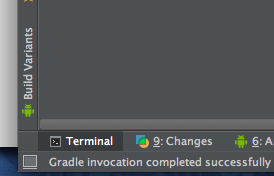 When you added the instrumentTest.setRoot('src/test'), you actually told Gradle that your tests are located in the src/test/java folder, which is now marked in green. Before we configure Robolectric further, let's first create a new package and a dummy test case. Next on the list is telling Gradle that we are using Robolectric and jUnit for running our test cases. The libraries are available from Maven repositories and we need to modify our classpath. This modification needs to be done in the build.gradle file where we added the test sources. Synch your project again via Tools > Android > Synch Project with Gradle Files. Now lets create our first Test, which is programmed to fail. * Created by vandekr on 11/02/14. Now Hold On! How do you run these tests? Well, Gradle will be your Holy Grail here: we told it to install the robolectric plugin from the snapshot maven repository. Android Studio is truly an Integrated Development Environment, as it gives you a terminal (yes, a terminal, like old-school-vi-programming). This will build your application and start the robolectric tests, just like that! PS: if you get a "Permission denied", it means that the ./gradlew file is not executable. Just chmod it! Note: ./AndroidStudioProjects/MyRobolectricTestApp/app/src/test/java/be/acuzio/mrta/test/DummyTest.java uses or overrides a deprecated API. Execution failed for task ':app:robolectric'. Run with --stacktrace option to get the stack trace. Run with --inf or                                                                 --debug                                                              option to get more log output. Wonderful! It actually did what we expected. Now let's update the test code and change the assertion to Boolean.TRUE. Re-run the tests using the ./gradlew robolectric command in your terminal. Your terminal should now display the message "BUILD SUCCESSFUL". Eureka! What we just proved was that we can run tests from Gradle, but we are not there yet: we want to test our Android code, which uses Activities, Services and all of these nifties things. Create a new Test Class called MainActivityTest and match it to the code below. We actually tell Robolectric to create a new Activity (MainActivity) and to return it. We then assert that it is not null. Now re-run the ./gradlew robolectric command, you should get a "BUILD SUCCESSFUL" for both tests. Now you are ready to start developing and create your unit tests! Gradle and Robolectric render an HTML file containing your test results, which is quite nice in a Continuous Integration environment. It's located in your Android Studio project folder, in the project build/report folder. When you open it, it will provide a nice overview of the results with passes and fails. I'll post some more testing examples, in next weeks to help you improve the quality of your Android project. Please feel free to comment and propose improvements!